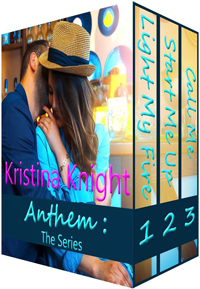 Today's featured book is The Anthem Trilogy Boxed Set by Kristina Knight. Lily MacIntyre's life is off-track, and she knows exactly how to right it: shed her America's sweetheart image in a big way. Getting down and dirty in a limo with rocker Nate Lansford seems like the perfect solution. Plus, she's had a mad crush on him practically since birth. The only problem? Nate is her brother's best friend, and he doesn't see her as anything other than a surrogate little sister. Hollywood hottie Chase MacIntyre wants the gossip surrounding his latest fling to stop and he knows exactly how to do it: show up on his next red carpet with a new woman and once he meets Nina Wright he knows she is the woman to stop the presses. The problem? Once they're under cover, this business-only agreement is definitely too hot to handle. Katrina Phillips is itchy. The job that has always challenged her seems stifling, her friends are all pairing off, and she's been without male companionship for seven long months. But five years hasn't been long enough to douse the flames between them, and it's hard to remember why things went so badly in the first place.